Building a tequila company takes a village. One of our most recent partners to help Tanteo fans “spice up their life” is NightOwl, a new way to discover nightlife. NightOwl users can create, save and share lists of their favorite places, for any occasion to plan better nights. 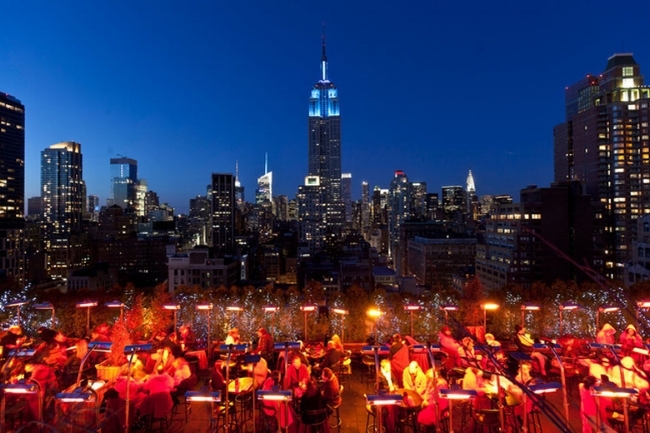 To celebrate this partnership, we've re-posted some of our favorite New York rooftop & outdoor spaces that serve Tanteo. Be sure to check out NightOwl for a list in your home city. New York’s largest outdoor rooftop is filled with greenery-lined walls overlooking midtown. It’s a great spot to check out in the summer but It’s also open year round, and equipped with blankets and space heaters in the colder months. 230 Fifth’s signature margarita is the Tanteo Jalapeño Margarita, perfect with a burger or their Sunday brunch buffet. This glamorous 30th-floor cocktail lounge has panoramic views of midtown, at the Skylark, drink the Jalapeñto Margarita (no typo), a great combination of sweet and spicy. Originally built by John Jacob Astor IV, this New York landmark has recently been restored to its original glory. Over the years the Knickerbocker has attracted the likes of John D Rockefeller and F. Scott Fitzgerald. You can enjoy in similar luxury with Tanteo, overlooking Time Square, be sure to try “the Spicy Cadillac” when you visit. This Midtown oasis with a great view of the Midtown West, The Attic serves Dusk Til Dawn with Tanteo, but if you get too hot in the summer, ask your bartender for a Tanteo Jalapeño Margarita Slushy for a refreshing treat. This Thai gem hidden in Williamsburg serves a big menu of traditional and new Thai dishes. Sit on the sidewalk and try their “Spicy Ginger Margarita” with your curry. Go to the playa without leaving midtown. 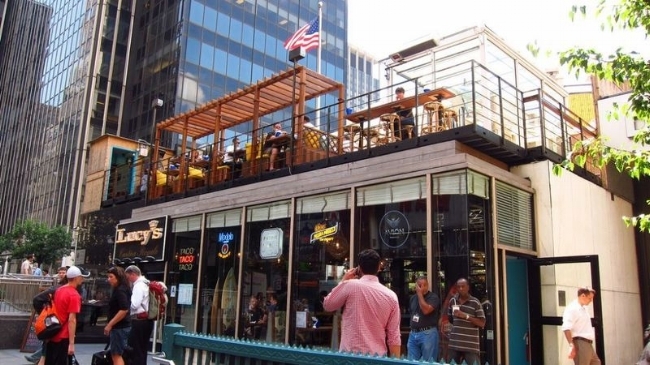 Beach vibe, fish tacos, and attractive servers at this Penn Station hangout. Make sure to order The Naked Devil before you take the train out to the Hamptons. A Spacious pier located on the Chelsea waterfront, nothing says summer in New York like a cocktail at the Frying Pan. Get here early to grab a seat at this busy pier, or stay late and go dancing in the big red boat’s hull. Grab some grub and wash it down with a Spicy Watermelon Margarita before the season ends! An East Village staple, Boulton’s sidewalk seating is a great place to people watch during brunch and happy hour. Celebrate with their Mexican Revolver. Located on the north end of Union Square Park, the aptly named restaurant lives in the beautifully renovated pavilion of this historic park. Try the Tropical Storm with Tanteo Tropical Tequila and sip the afternoon away. A beach themed restaurant inside Riverside Park, this is a go to spot for a lazy summer day. The upper level is made of repurposed shipping containers, and the lower lounge area is adjacent to beach volleyball, soccer and softball fields. Be sure to get here early and stay through the sunset, with the beautiful views of the the Hudson River. Grab The Easy Rider cocktail, and take it easy at Ellingtons!